Today is National Blueberry Muffin Day! To celebrate this classic breakfast and snack food, we're sharing two recipes for these berrylicious muffins (one of which is vegan). Blueberries are full of antioxidants and they're not only nutritious, they're good for your heart and may even help prevent urinary tract infections. Our first blueberry muffin recipe is a classic. The recipe uses frozen blueberries, but you can experiment with fresh, frozen, and dried berries to see which kind you like best. One muffin is less than 150 calories and has 5.5 grams of fat. Ingredients: all-purpose flour, sugar, calorie-free sweetener, baking powder, salt, ground allspice, frozen blueberries, fat-free milk, vegetable oil, egg, lemon rind, orange rind, vanilla extract, cooking spray. Our next recipe is from blogger Caitlyn Elf who modified a recipe to make vegan blueberry muffins. To increase the fiber, the recipe calls for 1 cup all-purpose flour and 1 cup whole wheat flour. Buttermilk is replaced with soy milk to make it vegan, and among other sub-ins, flax meal and water are used instead of an egg. 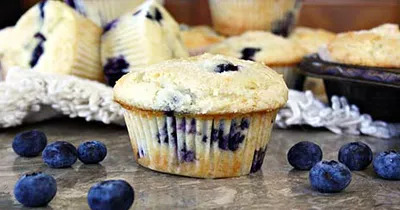 Ingredients: all-purpose flour, whole wheat flour, soymilk, granulated sugar, baking powder, baking soda, salt, fresh blueberries, lemon rind, lemon juice, cooking spray, vegan buttery spread, flax meal, water, powdered sugar (optional).